KING SOCIAL ‘PARTY’ TOUR AT THE JACK CAIRNS IS SET TO BE THE BIGGEST PARTY OF THE YEAR! UFC 205 ALVAREZ VS McGREGOR Showing Live From Madison Square Garden at THE JACK Cairns! TIKI TAANE ‘NO PLACE LIKE HOME TOUR’ STANDS WITH STANDING ROCK AT THE JACK! BULLHORN are set to blow the roof off The Jack with special guests In ‘The Element & Machine Machine!’ FREE SHOW Sat Sept 3rd! THE JACK MAIN EVENTS PRESENTS: UFC 202 DIAZ vs McGREGOR 2 “THE REMATCH” SHOWING LIVE ON 4 MASSIVE SCREENS WITH FULL STADIUM SOUND!! 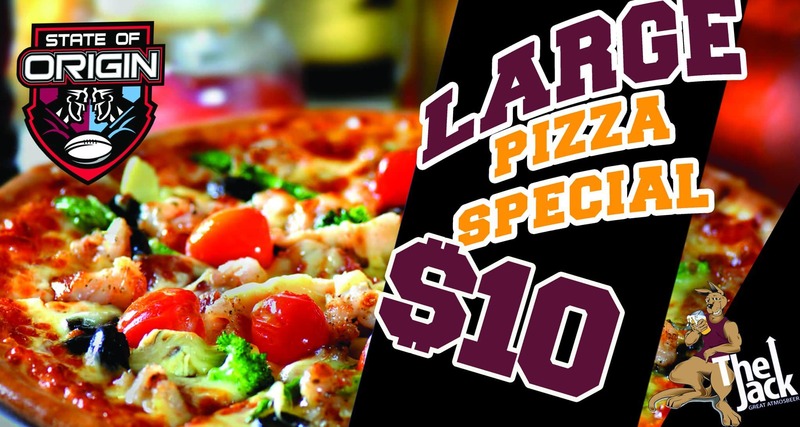 State Of Origin $10 Large Pizzas All Night!!!! Our famous $10 Large Footy Pizzas are back for EVERY State Of Origin Match kicking off this Wednesday June 1st! GO QLD!! !